Last week, the boys and I were in our local CVS, buying random crap we needed. I was herding them, like cats, as I do, to the checkout, when the cashier told me to take my little CVS card thingy to a kiosk a few feet away to get extra coupons. Morgan volunteered for the task. He loves bar code scanners and kiosks. The cashier, being ever so helpful and chipper, gave Morgan about rapid five prompts at once. And yes, I told her his name. "Son, sweetie pie? Just scan your mommy's card! Wait about a minute! No just wait, don't touch the screen! There will be coupons coming out! Go to the right side! See that slot? Now, wait for the coupons! Now, wait and grab the coupons from the side where the slot is, sugah!" Amused, I helpfully told her, "He's autistic, he might not respond to all of those commands, and you didn't say his name. He'll figure this out, just watch." Morgan figured it out, flapping happily with this new kiosk and coupons. The cashier, however, dumbfounded me with her chipper, "Oh! My daughter is a little autistic- a touch Asperger's, so am I. Just a touch, though." The last part was whispered with very wide eyes. I about choked on my laughter. "A touch, huh? Well, we're fully in the autism pool. We're kind of swimming in it," I replied, "Big A over here." I thanked her for saving me $17 dollars, herded the kids out the door and have been pondering the exchange ever since. How is one just a "touch" autistic? Is it just their left side of the body that's impacted? Perhaps a toe? Maybe just their hair? Does the autism only happen when they put on shoes or take them off? And what does that IEP look like? I'm dying to know! Do these people have "Since there is only a touch of autism, XXXX will only need a touch of ST, OT, and prompts a touch of the time"? Or is there another eligibility? Come to think of it, I met a psychic in New Orleans named Rena who claimed she was a touch "of that spectrum thing." Perhaps this explains it. Now I'm just confused. I've encountered people who deny their children are on the spectrum, despite the neat and long lines of objects all over the house, the strict diet of only three foods, meltdowns, strict schedules, and the fact that their child is still not speaking at age five or six. That's denial, possibly. I've met people who have claimed that "everyone is just a 'touch' autistic" but have usually brushed them off as an "aw, bless your heart!" thing. I get that this is an exclusive club and maybe they don't want to learn our secret hand flap followed up by the acronyms, so maybe having just a touch saves them the work of gaining full entry. They shouldn't be so scared! Hell, it only takes a year or five to get used to all of this. And that hand flap is a breeze learn. Also, we nail that "A-dar" pretty fast. This woman never registered on mine, so I call a false "touch" there. 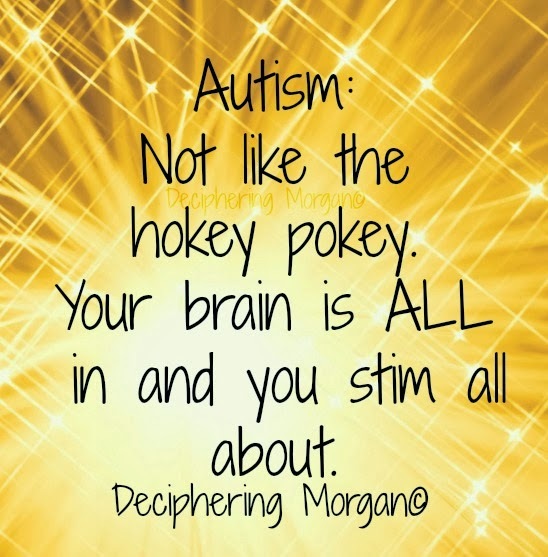 Autism isn't the hokey pokey. You don't get to put your left arm in and take it out. Rather, your brain's all in and then you stim all about. Or perhaps just a touch of the stupid. fewer sporns equals less autism. This is known. Probably drinks a boatload more orange juice than you do. Nice write up. Fantastic blog.